The classic “Back to the Future” films are popular for good reason, but lately they’ve particularly gotten a lot of buzz. The second film, made in 1989, saw Marty McFly and Doc Brown (and a dubiously-knocked-out-early-on Jennifer Parker) travel from 1985 to the futuristic year of… 2015. Wednesday, October 21, 2015 to be precise. The film decided to take a light-hearted look at life in the then-future, with the usual sci-fi cliches seen: flying cars; hoverboards; robotic gas station attendants; massive inflation ($50 for a Pepsi! ); and endless sequels to blockbusters. Fine, so they got that last one right. In that spirit, here’s a look at seven examples of how things have changed between 1985 and 2015. If needed, I’ll note what the films got “wrong” about life in 2015, but I figure there’s enough articles covering that already. The number of TVs owned by the average American household in 1985 was 1.83 sets. By 2009 (the most recent year’s numbers I could find), it’d risen to 2.86 sets per household. Basically, we’ve gone from an average of two TVs in 1985, just like the McFlys, to owning three TVs today. In the first film, Marty’s rock group, the Pinheads, try out for an audition but don’t pass. A later scene has Jennifer urging Marty to send a cassette tape of the band’s music to a record company. These days, with the rise of the Internet, Marty would use YouTube and/or Soundcloud to offer samples of his band’s music. Presumably, any music Marty would submit to a record company nowadays would be via MP3 or a recorded CD. A recurring theme in the films’ 1985 and 2015 settings was a Hilly Valley committee that was dedicated to preserving the courthouse clock tower, not wanting the city to replace the historical clock with a new one. By 2015, the committee is still at work trying to save the clock tower. While the mayor’s changed (Mayor Wilson’s son is mayor by 2015), their fundraising techniques are still the same: asking in person for donations. The 2015 fundraisers did adapt one piece of “future” tech: asking individuals to press their thumb to a scanner to make a cash transaction. Fingerprint scanning tech does exist, but it’s more for security uses (unlocking smartphones) than financial transactions these days. A supermarket I used to go in the 2000s did try a BTTF-style fingerprint-based transaction system, but it didn’t catch on, and was removed. These days, smartphones are becoming popular as a means of performing financial transactions. Many smartphones can be unlocked using a fingerprint scanner, and transactions can be performed using a variety of systems (such as Apple Pay or Android Pay). There’s also credit card readers for mobile devices that’ll swipe a magnetic strip-based credit card; such systems are popular for small business owners. I’ve seen them used at comic book conventions. Of course, the fundraisers could eschew fundraising in person, and go for an online solution, using Kickstarter and similar sites. In 1985, film photography was the norm, with a chain of mall parking lot-based small stores called Fotomats commonplace. You’d drop your film off (sometimes via a drive-through), then come back to pick up the developed pictures. A Fotomat gets demolished in the first film as a result of the Libyan/DeLorean chase. As for Fotomat’s fate, the rise of cheaper and faster one-hour film developing allowed drugstores and supermarkets to start their own film developing services. Fotomats as a result largely shut down, with Fotomat’s parent company switching to digital services; however, by the late 2000s, even those had shut down. “The Simpsons” referenced Fotomats in a mid-90s episode, where we see in Springfield they’d been turned into taco stands (“Tacomat”). These days, there’d be no film developer for a car to smash into, unless it’s a dedicated photography shop. 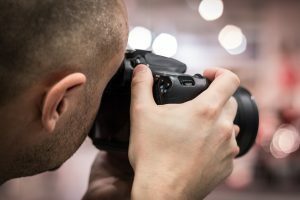 Digital cameras have outsold film ones since the mid-2000s, and the latter outside of hobbyists/professionals is now extinct. These days, smartphones have become the normal photo-taking device for the average person, with photos stored either online (Flickr, Instagram, Facebook, etc.) or on computer hard drives. The films put some emphasis on Hill Valley having elected an African-American mayor by 1985, Goldie Wilson. Apparently Wilson established a legacy akin to Chicago’s Richard Daley, as his son (Goldie Wilson II) was mayor in 2015. The second film also shows a rise in the influence of Asian culture by 2015, with ads for tourism in Vietnam, and Japan as an economic superpower. Both of these were based on then-recent entertainment and political trends. These days, the US population makeup’s changing. In 1980, the US had a population of 226.5 million, versus 309.3 million in 2010. Growing Latino and Asian populations, plus other minority groups, has led to 2014 becoming the first time US schools have a majority non-White student enrollment. Latinos now outnumber Whites in California’s population. While it wasn’t shown in “Back to the Future II”‘s 2015 setting, Hill Valley High School in 2015 probably looks different from Marty’s 1985 heyday. Doc notes in the first film that he’d like to go ahead 30 years and see “who wins the next 30 World Series.” Of course, a baseball player strike in 1994 saw no World Series that year. As much discussed online, in 1993, Florida’s gained a baseball team, the Florida Marlins. The team changed its name to the “Miami Marlins” in 2012. They’ve won two World Series, in 1997 and 2003. As for the famed “Cubs win the World Series” scene in “Back to the Future II,” the Cubs are in the World Series playoffs this year. Of course, even if they lose, 2015 has already seen a Chicago sports team beat a Florida based team (that didn’t exist in 1985) for a championship: the Chicago Blackhawks beat the Tampa Bay Lightning to win this year’s Stanley Cup. In 1985, Marty’s a drinker of Pepsi Free and Tab. Tab still exists, though its popularity’s taken a significant dive since the mid-80s, thanks to the rise of modern diet soft drinks like Diet Pepsi and Diet Coke. Pepsi Free still exists, having changed its name to “Caffeine-Free Pepsi,” since that’s what it was—a caffeine-free version of Pepsi. There’s even a diet version available. Nowadays, soft drink makers face a bigger problem than what to name their beverages. After years of rising consumption, soda consumption’s leveled off, and has even been on a major decline. There’s various reasons for soda’s drop in popularity: campaigns for healthier lifestyle choices; concerns about artificial sweeteners in diet sodas; a backlash against high fructose corn syrup as a sweetener; and trendier, healthier drink choices (the rise of newer coffee options like Starbucks, etc.). Bottled water will soon eclipse soft drinks in sales. The New York Times recently ran an article outlining soft drinks’ problems. 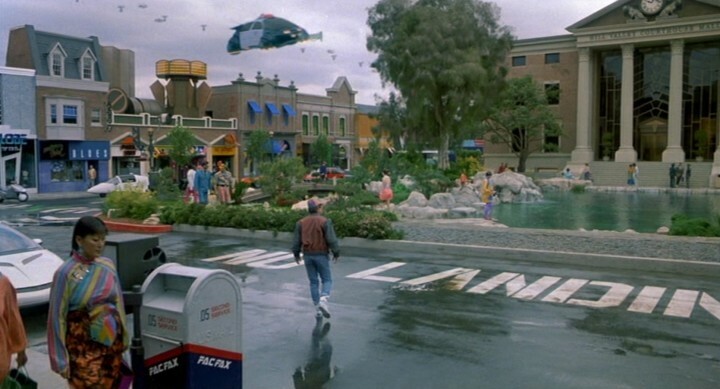 That sums up some of “Back to the Future”‘s major 1985 elements. Of course, there’s been plenty of other changes of a cultural or societal nature since 1985. The more cynical aspects were touched on in this (some-expletives-using) CollegeHumor video parody showing Doc and Marty visiting the actual 2015, and finding it disappointing.